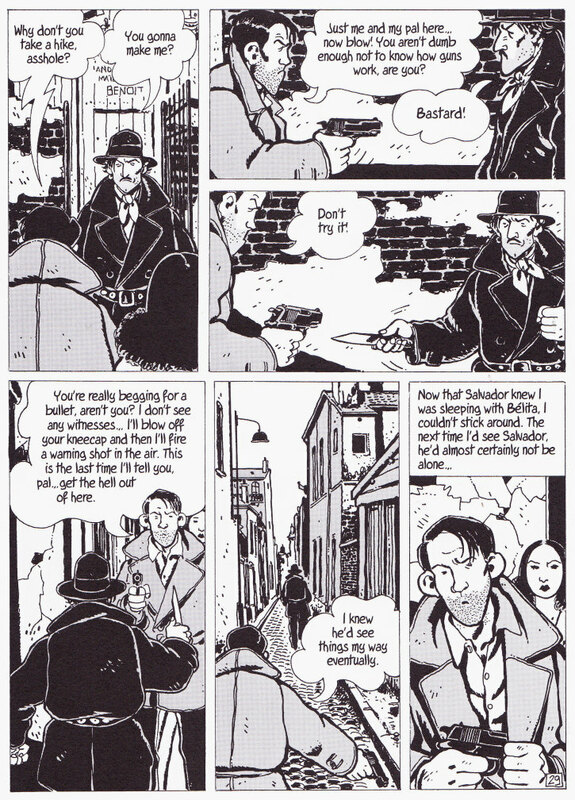 I absolutely love the work of Jacques Tardi, from his crime tales to fantastical Jules Verne-esque yarns like the Arctic Marauder or the bitter, powerful anger of It Was the War of the Trenches (see here) and Goddamn This War (reviewed here), he is, for me, one of Europe’s great masters of the ninth art. 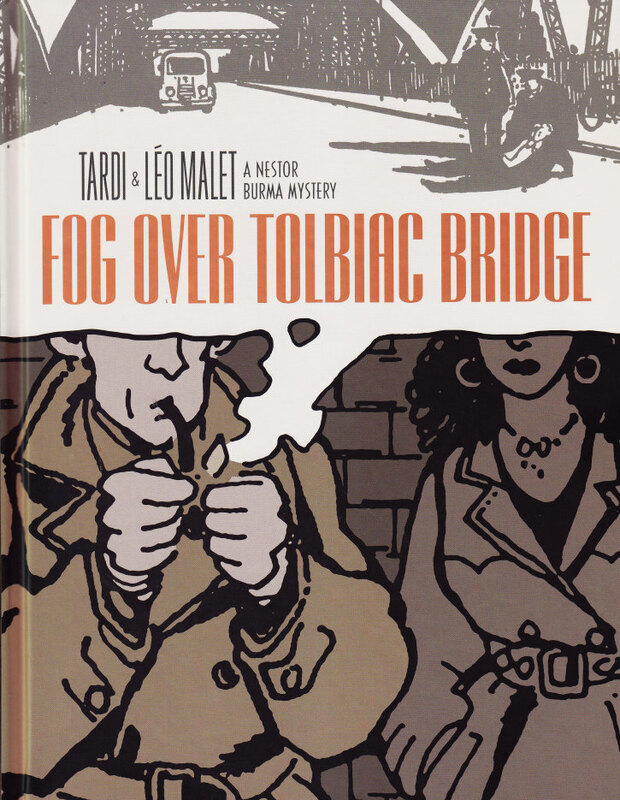 I also have a fondness for a dash of Noir, so combine Tardi with a Noir murder featuring Leo Malet’s detective Nestor Burma and oh yes, you better believe I wanted to get my little ink-stained paws on it. And rather a handsome edition it is too, a slim hardback album, with some nice metallic highlights on the front and back cover (sadly not so obvious in the scan above, but quite striking when you see it with your own eyes), a nice addition to Fantagraphics’ Tardi library on my shelves. It even comes with nice end-papers detailing a map of the relevant part of Paris, marking the location of the main events; in conjunction with the actual comics art it gives a great impression of the place, you can feel your way around the mean streets. Nestor receives a letter from Abel Benoit, claiming to be an old comrade who desperately needs his help, “a scumbag is planning something dirty.” He addresses Burma as both “comrade” and a “brother” and hints at their old days in their youth. There’s one problem – Burma doesn’t recall ever knowing an Abel Benoit at any point in his life, the name means nothing to me. But the detective is intrigued, and so he ventures off across a rainy Paris, the trademark trenchcoat collar turned up, heading to the hospital this Benoit is being treated in. And he’s being followed, by a mysterious, dark-haired woman; she’s behind him right from his office, on the train and the station, before finally approaching him. I don’t want to get into much more plot detail – I’d rather not potentially spoil any twists and turns, after all those are part and parcel of the fun of a good crime story. I will say that it involves elements from Burma’s own mis-spent youth, and mixes in the police (who have a fairly chequered past with Burma), an old case, a femme fatale (naturally) and more, in a very satisfying ratio. 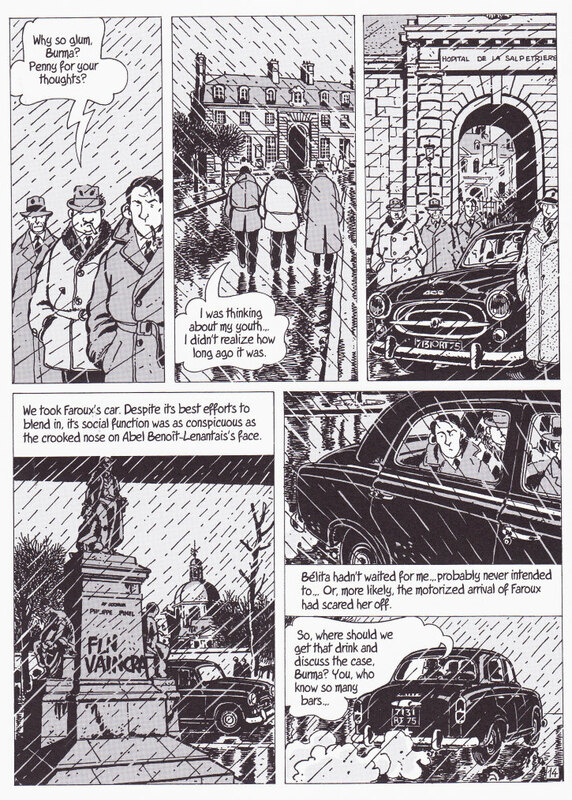 And this being Tardi, the visuals and layouts are just utterly superb. 1950s Paris, the streets tramped by our rumpled detective, usually in the rain (of course), the streets of the rough XIII arrondissement – now a bustling place with a large Asian community and shiny new business cenres on the Rive Gauche, but in this period it’s a down-at-heels, tough neighbourhood that Burma sneers at (fancy street names can’t hide the poverty and shabbiness), and yet he also clearly has some dogged affection for the area. Drawn in monochrome, which suits the very Noir atmosphere, there are some gorgeous visual throughout this book. 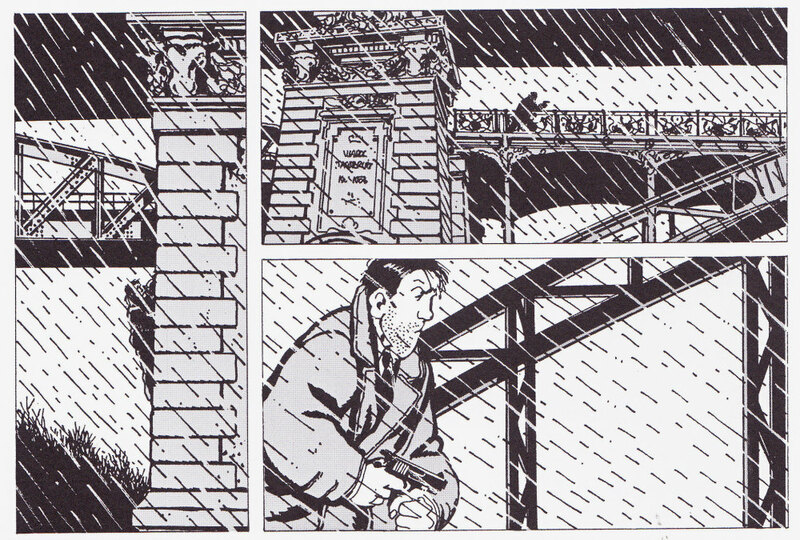 Many scenes follow Burma in his trenchcoat, scowl on his face, through those XIII arrondissement streets, the “camera” angle often directly behind of in front of him – the effect is reminiscent of those cool and stylish handheld camera shots through the Parisian streets by film-makers like Goddard, and makes the reader feel as if they are walking those street with Malet’s detective. 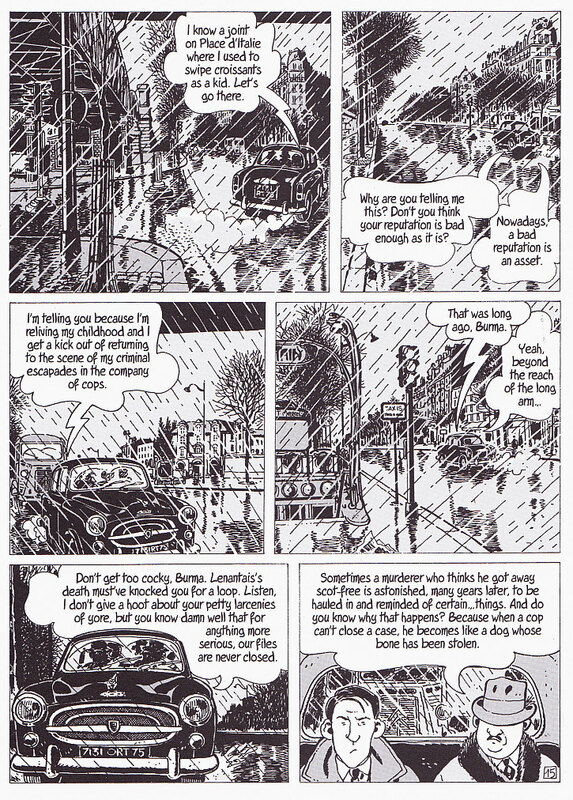 The rain-lashed 1950s streets are grey and chill, the pacing and sizing of the panels changing to reflect the story, smaller, more frequent during sequences where Nestor is being tailed, larger and slower for more dialogue-heavy character moments, while Tardi uses variable lettering sizes to convey emotions, shouting and other effects, a device he’s used very effectively before. 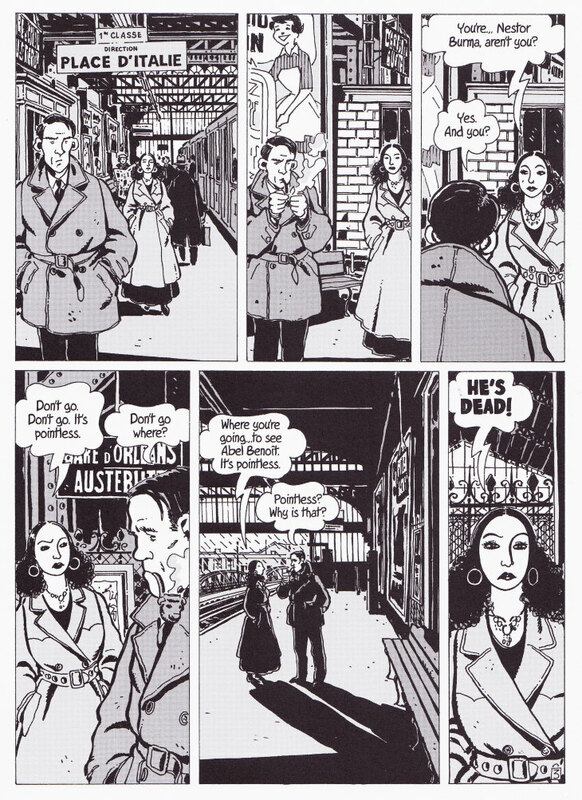 A gripping mystery, executed with some of the finest comics art Europe has to offer, mysterious dames, tough guys with a moral centre, an old case knocking insistently on the door of the present, and an atmosphere that oozes Noir so much you’d think the fog itself could wear a Fedora. This is one to curl up with, and like a good Raymond Chandler, or Malet for that matter, this is a book that you know you are going to go back and revisit.